The highway traveler will pass through Tok twice, once coming into the state and once again leaving Alaska. 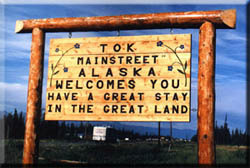 Because Tok is the only community that can boast this fact, and considers itself to be a goodwill ambassador for the state, Governor Walter J. Hickel in 1991 proclaimed Tok "Mainstreet, Alaska." This population of approximately 1,415 is located 90 miles west of the Canadian border, between the Tanana* River (to the north) and the Alaska Range (to the southwest), 200 miles southeast of Fairbanks. Tok is a bit undefinable. It is a town that isn't. Tok is not incorporated; it is not considered a city, town, or village. The inhabitants call themselves a "community" for lack of a better definition. 1.) Tok took its name from the Athabascan Indians who used to gather here. It means peaceful crossing. 3.) Tok was named after a husky pup on August 15, 1942 when the U.S. Army’s Corp (the 97th engineers—an all black corps) were breaking trail north from Slana on what is now the Tok Cutoff. They were working their way to the point where they would intersect with and begin breaking trail southeast on what would become the Alaska Highway. Their job consisted of not only building the road, but naming points along the way. The young pup, named Tok, was their beloved mascot, and upon their arrival at where Tok now is, it was unanimously decided to name the junction after the pup. Tok began in 1942 as an Alaska Road Commission camp. So much money was spent in the camp's construction and maintenance that it earned the name "Million Dollar Camp" by those working on the highway. In 1944 a branch of the Northern Commercial Company was opened, and in 1946 Tok was established as a presidential town site. With the completion of the Alaska Highway, a post office and a road house were built. In 1947 the first school was opened, and in 1958 a larger school was built to accommodate the many newcomers. The U.S. Customs Office was located in Tok between 1947 and 1971, when it was moved to the border. Tok faced extinction when a lightning-caused forest fire jumped two rivers and the Alaska Highway, putting both residents and buildings in peril. The town was evacuated and even the efforts of over a thousand firefighters could not stop the fire. At the last minute a "miracle wind" (so labeled Tok's residents) came up, diverting the fire just short of the first building. The fire continued to burn the remainder of the summer, eventually burning more than 100,000 acres. The area was traditionally Athabascan, although the current population is primarily non-Native. Now, only 19% of the population is Alaska Native or part Native. Today Tok is the trading center for the Athabascan Native villages of Northway, Tetlin, Tanacross, Mentasta, Eagle and Dot Lake. Tok is located in the Fairbanks Recording District. The area encompasses 132.3 sq. miles of land and 0.0 sq. miles of water. In the winter, ice fog and smoke conditions are common. The average low temperature during January is -32 degrees; the average high during July is 72. Extreme temperatures have been measured from -71 to 99. * Tanana is pronounced tan'-uh-naw. It does NOT rhyme with "banana."